This topic describes how to add or remove a WCF RIA Services link between a new Silverlight client application and an existing ASP.NET project. A RIA Services solution basically consists of client and a server projects that are linked by such a RIA Services link, so adding and removing them is a critical task. This topic assumes that you have completed the Walkthrough: Creating a RIA Services Solution, Walkthrough: Using the Silverlight Business Application Template, and Walkthrough: Creating a RIA Services Class Library topics, or have equivalent knowledge and an existing RIA Services solution available. 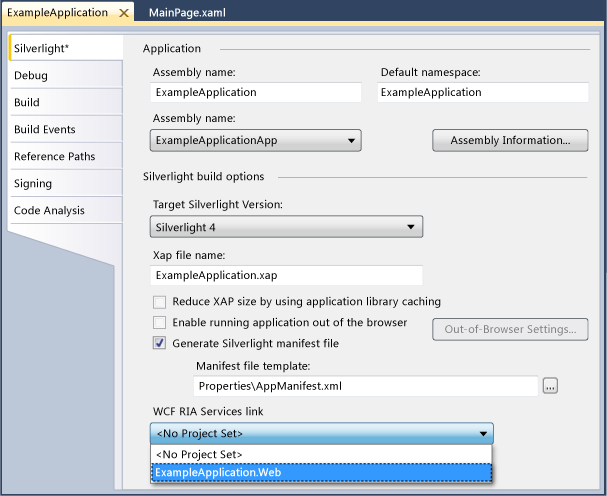 When you create a new Silverlight Business Application project, you can create a new WCF RIA Services Class Library project, or you can select the Enable WCF RIA Services check box in the New Silverlight Application dialog box, and a RIA Services link between the client project and the server project is created automatically. Open an existing RIA Services solution. In Solution Explorer, right-click the Silverlight client project and select Properties. The Silverlight tab of the project designer appears. In the WCF RIA Services link drop-down list, select the server project that you want to use for the middle tier with this client project. In Solution Explorer, right-click the Silverlight client application and select Properties. In the WCF RIA Services link drop-down list, select <No Project Set>.